The Daily Gourmet: Dinner is Done! I'm finally back to my "cooking roots" or so it seems. I'm really not a fan of assigned recipes. I much prefer following my own ideas, and if not my ideas tweaking a recipe to suit my tastes. This was a yummy recipe I tried...and oh mamma mia this was something that made my tastebuds dance w/ delight!! This was amazing and absolutely delicious! My changes to the recipe (linked above) were minimal. You do NOT need to use that much milk for the egg milk bath. So I dropped it to 1 egg and 1/4 cup milk. I elected to use grapeseed oil as it has a higher heat tolerance. I used a mix of Italian seasoned Panko and Italian seasoned breadcrumbs, instead of all heavy cream (and to save calories) I used a mix of 1% milk & heavy whipping cream using a 3:1 ratio. I used a 6 cheese Italian blend and I left out the salt - the proscuitto is MORE than salty enough. Once the chicken was finished I kept it warm in the oven. Other than that there were no other changes. I used barefoot pinot grigio as it's a good quality white wine. Next time I'll toss in some fire roasted bell peppers. This is a "dining in" dinner and a keeper! I'm a fan of Alfredo Sauce, and yes to some I know it's been called "heart attack on a plate" which I'm sure is sacriledge to those who are famous for it! It really needs no changes BUT for healthy eating I have used a fat free cream cheese and 1% milk. It makes a LOT of sauce as followed, so don't say I didn't warn you! One of the January assignments was for crockpot cooking - and the crockpot is certainly NOT a stranger in my kitchen! I use my crock pot at least 10x's each month. What's not to love about prepping your meal and then being able to walk away from the kitchen knowing that in a few hours dinner will be ready and you'll have gotten other things accomplished! 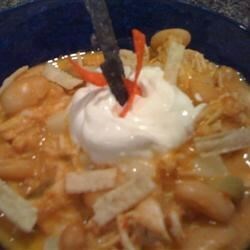 I tried a White Chili recipe from Allrecipes.com and WOW!!! I was impressed!!!! I'm a firm believer in good food w/ few ingredients, but admittedly I inwardly cringed and thought NO WAY will this even taste good b/c it had only FOUR ingredients!!! I'll also say that I'm a self-avowed food snob and really didn't have much expectations for this recipe, but WOW it was creamy, hearty, and wholesome! Naturally my addition of sour cream and some tortilla strips may have upped the calories a smidge, but this recipe is a keeper! They're simple and semi-homemade, but if you're a busy working adult and don't have the time to do from scratch brownies, they'll work in a pinch! These are definately "Gourmet at Home" - and if I had someone special in my life it's something I would have no hesitation making for a Valentine's day dessert or any other time I wanted a special dessert at home. I could also see a dark chocolate brownie w/ a garnish of a raspberry coulis! Ever go to the grocery store and see those "fluffy frosted sugar cookies" - and you think they taste SO good even if they have a funky chemical taste to them? Well this is an amazing at home sugar cookie that if you try will have you thinking twice about buying any of those cookies again! Soften the butter at room temperature. Cream the butter w/ the sugar & add eggs one at a time. Sift the flour to measure 3 1/2 cups - please note this is NOT the same as measuring then sifting. Once you've sifted and measured the flour, add it to the creamed butter mixture 1/2 cup at a time, until thoroughly combined. Next add the baking powder & extracts. Using a small 1 Tbsp spring hinged ice cream scoop, scoop out the cookie dough and place it on parchment lined baking sheets. Bake for approximately 12 minutes. Let cool before frosting. Combine confectioners' sugar butter, vanilla and milk, beating until creamy. Thin with a few more drops of milk (if necessary) to reach desired spreading consistency. Sprinkle w/ assorted decor topping. You know those yummy potato wedges that often have cheese, bacon, sour cream, and other toppings? Yeah the type that go straight from the lips to the hips if you're a woman? Well these are a great at home rendition! Rinse off the potatoes, and slice into 1/4" thickness. Add olive oil and seasonings to a gallon size ziploc bag, add in the sliced potatoes and toss to coat. Line a rimmed cookie sheet w/ foil (non-stick foil works great!) Spread potato rounds on top of the foil. Bake at 420° for about 25 minutes, then drop the heat to 350° for another 15-20 minutes. Add the chopped bacon and cheddar during the last 5 minutes of cooking. Top w/ sour cream and chives if desired. Haha - well I seem to have an affinity for food that's South of the border, but I'll admit I'm not Hispanic and thus any of my attempts to cook food from any of the Latin Countries will pale in comparison! Having said that I made some Enchilada's. I can see the cringing already. 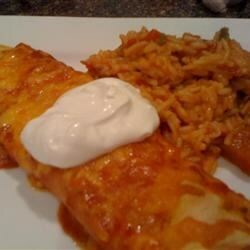 Yes it's NOT an authentic recipe *hanging head in shame* For a quick gringo made enchilada it wasn't bad tho! Cocktail time: I'm my own barista, bartender whatever you wanna call it. My friends joke w/ me that I could open up a bar - but for all the liqueur, wine and alcohol I may have I seldom drink it as much as I cook w/ it! Pretty to look at and well I'll let you be the judge of the taste if you try it! I welcome constructive criticism that is relevant. When I have a person who chooses to make rude, hateful comments about what I look like, then I will certainly moderate and delete those comments. Having said that this is my blog, and I track statistics to include the IP address of each person who visits my blog in the event I have to report people.